The Republic of Serbia. It contains two autonomous provinces: Vojvodina and Kosovo and Metohija. Serbia is located in the central part of Balkan Peninsula in the southeastern part of Europe. In Serbia live about 10 million people. 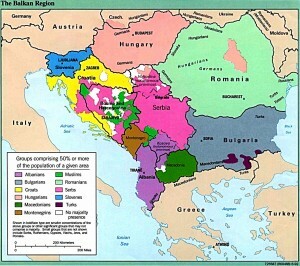 The majority of the population are Serbs (66 percent), and numerous other immigrants living in Serbia from 37 nationalities also live in Serbia are Albanians (17 percent), Hungarians (3.5 percent), followed by Romanians , Croats, Bulgarians and others. All citizens have equal rights and responsibilities and enjoy equal national of Serbia. Serbia’s official language is Serbian and official alphabets are both the Cyrillic and Latin alphabet. In areas inhabited by minority nationalities, languages and alphabets of the minorities are in official use, as by law. The climate in Serbia is temperate continental, with a gradual transition between the four seasons. Serbia’s summers are warm, with temperatures up to 35 ° C and winters are cold and snowy Serbia, with the temperature – 10 ° C to 10 ° C). The capital of Serbia is Belgrade (Beograd original name, White City), with a population of 1.6 million. Belgrade is the administrative, economic and cultural life of Serbia. The main religion in Serbia is Christian Orthodox, but there are also other religious communities: Muslim, Roman Catholic, Protestant, Jewish and others in Serbia. Orthodox Easter – from Good Friday until the second day of Passover. During vacation employees only stores and institutions on duty are open. In Serbia the believers are entitled to not work during religious holidays, depending on their religion. International credit cards Visa, Master Card and American Express are accepted in Serbia in most stores Serbia, Serbia airlines, hotels and restaurants in Serbia. Food shops are open daily from 06.00 am to 09.00 pm including Saturdays, while Sundays Serbia shops are open from 08.00 am to 02.00 pm. In every city in Serbia and Serbian people, shops are open 24 hours a day. Markets are open every day from 06.00 am to 05.00 pm. During weekdays, banks and post office in Serbia are open from 08.00 am to 07.00 pm. On Saturdays, banks and post of Serbia are open from 08.00 am to 03.00 pm. In Belgrade and other larger cities of Serbia, some banks and post office are open on Sundays. There is care in hospitals and clinics around the clock in Serbia.Serbia pharmacies are open from 08.00 am to 08.00 pm weekdays and on Saturdays from 08.00 am to 03.00 pm In Belgrade and larger cities there are pharmacies on duty. The code for Serbia is 381; for Belgrade (0) 11, Novi Sad (0) 21, Nis (0) 18 etc. For international calls from Serbia mark 99 the required country code for the city code. 267 Hotels in Serbia, Serbia 96 motels, 306 vacation complexes, mountains and other holiday accommodation in Serbia. Total number of beds in Serbia is 87,325 (35,458 hotels in Serbia). Andorra, Argentina, Australia, Austria, Belgium, Belarus, Bolivia, Bosnia and Herzegovina, Bulgaria, Canada, Chile, Czech Republic, Costa Rica, Croatia, Cuba, Cyprus, Denmark, Estonia, Finland, France, Germany, Great Britain, Greece , Hungary, Holy See (Vatican), Ireland, Iceland, Italy, Israel, Japan, Latvia, Liechtenstein, Lithuania, Luxembourg, Macedonia, Malta, Monaco, Netherlands, Norway, New Zealand, Poland, Portugal, Republic of Korea, Romania, San Marino, Seychelles, Singapore, Slovakia, Slovenia, Spain, Switzerland, Sweden, Tunisia, the United States of America. Serbian Keywords: Embassy of Serbia. Consulate of Serbia. Serbia surface. Population of Serbia. Geography of Serbia. Political System of Serbia. National Holidays in Serbia. Visas for Serbia. Pre fixed phone in cities of Serbia.